My first blog! Where do I start? A question I have been pondering about for the last couple of days. After a little thought about what I like the most, I realize, the first thing I should be writing about is the one topic that I am most passionate about – Movies. Talking of movies, over the last few days there has been tremendous excitement about the upcoming James Cameron movie ‘Avatar’. I being one of his biggest fans have been looking forward to watch this movie in 3D. What with the entire buzz about the new technology used and the talk of it being the game changer in the motion picture industry. Would this movie really change the way we look at films? Would this be the turning point in the evolution of cinema? Are we at the threshold of a new era in the experience of movie watching? So many expectations riding on this film and the initial word is extremely positive from the international press who got to watch this film before anyone else could. Lucky people, I say to myself, they are the first to witness history in the making. Yet not to be disheartened, as a small concession I have managed to book tickets for the paid preview for tonight’s show at a Delhi NCR multiplex, a day before its official release worldwide. Some concession that is, to soothe my hurt ego. How can I not be the first one to watch this film? I am after all the biggest fan of James Cameron’s movies. Every movie this man has made has been a game changer in the industry so far. He has not only made technologically superior films way beyond anything that was being made each time but also has always made films with a heart. His characters, always placed in extraordinary circumstances yet seemed so believable. He is a true master of technology as well as the craft of compelling storytelling. I have plenty of little stories to tell about each of the movies of his that I have seen. Let me think where to begin. Can I talk about the first film of his that I had watched? Am afraid I really cannot talk much about that film based on the first time I watched it in a B grade movie theater in a town called Warangal, as I do not remember a thing from that film. Ask me why? That was because I had my eyes and ears closed throughout, too scared to watch the ‘Aliens’. I remember, the movie traumatized me for quite some time. My parents from whom I have inherited my filmy genes loved the film and used to talk about it at home. I used to pretend to be a brave chap and show off to my friends that I had watched the ‘Aliens’ and tell them scary stories about the movie all cooked up by me. I must have been 9 or 10 years old then. Boy, did that Alien scare the living daylights of me then. It is another story that I watched the same movie many years later and was stunned by the brilliance of the film. One of the finest films creature films ever made. The next movie that I remember from my memory is ‘Abyss’, here too I don’t have much to talk about except for remembering all the talk about the huge tank that was built to shoot the movie and also not to forget the computer generated water thingy. A first of its kind then, this kind of technology had never been used before. I remember going to watch this movie at Sangeet Cinema in Secunderabad, one of the best cinema theaters of its time. We were a bunch of 12-13 yr old kids, who went to watch this movie. We were all disappointed, it wasn’t fun at all. This is my least favorite of all the movies that he has made. Next up was a movie that we all knew about for quite some time and most of my friends had watched it many times on their VCR’s but I never got the chance to watch it. The image on the cover of the video cassette of the guy with glares and the gun is something that I can still recollect from the video cassette library round the corner. The star of the movie was a guy whose name was such a tongue twister we wondered how someone could even think of naming their kid like that. Yes, you guessed it right. The movie is ‘The Terminator’ starring the now legendary Schwarzenegger (We used to call him TT as in Mr.Tongue Twister). The movie did release eventually in the theater after what seemed to be like an eternity. The movie was already 7 or 8 years old but it had a terrific plot-line and the execution was top-notch. After the movie, I cannot forget having those endless discussions and debates with my crazy bunch of friends about time travel and possible scenarios of what would happen if something like this really happened to us. It was unlimited food for thought, I can still have a debate today about the possibilities and implications of time travel based on this movie, just sets my mind on fire. A futuristic film that would still appeal to today’s audience, an instant classic, that is ‘The Terminator’ for you. Close on the heels of this was the sequel ‘Terminator 2’. Made many years after the first one but for us in India both the parts released within a short span of time. I do not want to talk about what was in the movie, its common knowledge and would be like stating the obvious but I want to talk about something that happened for the first time for an English movie in Hyderabad, probably in India. This film had a release, which was similar to something like an Amitabh Bachchan or a Rajnikanth / Chiranjeevi film (No, SRK was still not on the scene then). It released in a record number of screens and became an instant blockbuster. Against what usually used to be two theaters running 3 shows each it was something like 20+ theaters showing this film 4 shows a day across the city. Also a few months later DVD’s of this film were out, quite a novelty then, and for many years after that, sometimes even now, when you go to watch a demo for a home theater system what do they play? It is our favorite Terminator. There is this famous line where he says “I’ll be back”. Damn, let me tell you, when did he ever go anywhere to be back again. So mister Schwarzenegger (I still can’t type his correct spelling, I doubt if anyone can. Thanks to spell check (yes they have his name there), spares me the trouble of remembering it), he was the biggest star on the planet and the next big film was ‘True Lies’ with James Cameron. It was touted to be a great action drama. I was in my first year of college now, studying Architecture. Knew a little bit about visual effects and such stuff and thought of myself to be cleverer than the filmmaker this time, didn’t want to succumb to his tricks. I wasn’t prepared to be fooled, I was in college, I wasn’t ignorant anymore, I had grown up, I knew all the action was totally fake, shot in front of blue screens. Now I think, what stupid logic and thought process I had then, haha. Few minutes into the movie and all my arrogance had vanished. This was a clever and funny story with great characters and the action just blew me away. I remember watching it at least 3 more times on the big screen and enjoyed it better every subsequent time I saw it. One of my all time favorite films, still gives me an adrenalin rush watching some of the action. If ever a big star and a big director have to work together this is what a movie ought to be. Ok, now I come to the biggest of them all ‘Titanic’. A few words wouldn’t suffice to write about this experience. The small stories I have around this experience are so many that it would be unfair not to give this a titanic amount of space. 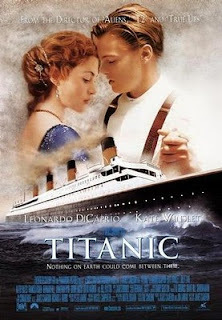 I will definitely write a separate post on ‘Titanic’ in future. For now I will summarize a few of the things, more like giving out statistics. I watched this movie all alone, first day of release in India, at Devi 70mm, Chennai (has the most awesome screen in the world, comparable to any IMAX). Also, did I mention that I watched all the above movies first day of release in India, I must be a crazy guy. Anyways, so it was a night show, got the tickets for the lowest class, worth I think around Rs5 for a cost of Rs100 in the black market. Tickets never got sold at the counters. Entire weeks shows were all full in advance. I sat in the second row from the screen; anyone who has been to Devi will know what I would have experienced sitting so close to the screen. What unfolded was sheer magic. I can recall a number of instances when the audience clapped in between scenes. By the way, Chennai has the most receptive audiences I have ever seen anywhere. They don’t hesitate to clap or whistle when something excites them on screen. Hard to find this kind of responsive crowd in this era of multiplex chains. At the end of the movie, there was a standing ovation from the crowd for close to 5 minutes, people just didn’t want to go out of the auditorium. I went back to my room that night mesmerized, the background score haunting me all night. I was staying with friends in Chennai, was there to do my final year Architecture internship then. Next day, what is the first thing I do? it was a Saturday, rushed back to the same theater after office, got the same Rs5 ticket for Rs100, the same second row again but didn’t mind it one bit, was just happy to be inside again. It was like spending a fortune then but I just had to see it. Couldn’t get the movie out of my mind. I went on to watch it 2 more times the same week and few more times over the next few weeks, and if I remember correctly every time I had to buy the tickets in the black market. Left alone I can go on and on about this film and I haven’t even spoken about the film yet. All I can say is that this film changed my life forever. After watching this film I made up my mind to drop plans of going to the US for my masters in Architecture and instead pursue visual effects and animation, my career of choice since then. My life changed forever after this movie. Am happy that it has turned out the way it has turned out to be. So that’s what I share with James Cameron and his films, I almost forgot about him for many years until now. Let’s see what ‘Avatar’ does to me. Tonight is the night. Will post my review after I watch it tonight, so tune in again.